Stevan Dohanos was an artist and illustrator of the social realism school, best known for his Saturday Evening Post covers, and responsible for several of the Don't Talk set of World War II propaganda posters. He named Grant Wood and Edward Hopper as the greatest influences on his painting. Dohanos attended the Cleveland School of Art. He worked in fine art as well as in commercial art. He was a member of the National Society of Mural Painters and the Society of Illustrators. He was a founding faculty member of the Famous Artists School of Westport, Connecticut. Dohanos worked for the Section of Painting and Sculpture of the U.S. Treasury Department, painting several post office murals, including those for West Palm Beach and Charlotte Amelie. His first magazine illustrator was for McCall's in 1938. In the early 1940s, he moved to Westport, Connecticut, and in 1942 he sold his first cover painting to The Saturday Evening Post. Dohanos went on to paint over 125 Post covers during the 1940s and 1950s. He also illustrated for Esquire and other magazines. In the 1960s he became chairman of the Citizens' Stamp Advisory Committee, which selected art to appear on United States postage stamps. He selected art for over 300 postage stamps during the administration of seven Presidents of the United States and nine Postmaster Generals. In 1984, the Postal Service's Hall of Stamps in Washington was dedicated in his honor. His easel paintings and prints have been displayed in the Cleveland Museum of Art, Whitney Museum of American Art, Pennsylvania Academy of the Fine Arts, and Dartmouth College. He was nationally known as an illustrator and magazine cover artist, particularly for his work appearing in The Saturday Evening Post, for which he created over 125 covers. He was a member of the Dutch Treat Club in New York City. 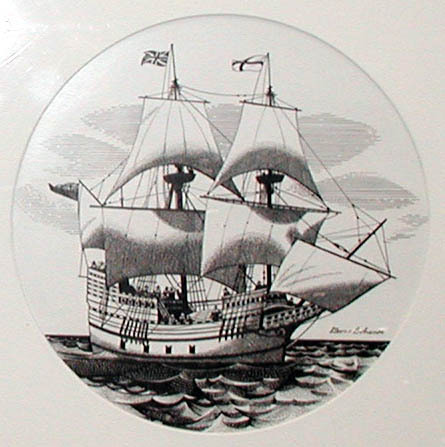 Dohanos, Stevan, “Sailing Ship,” Westport Public Schools Digital Collections, accessed April 25, 2019, https://collections.westportps.org/items/show/526.